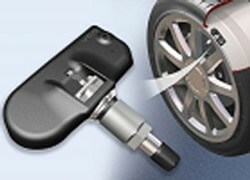 TPMS sensors, Tire Pressure Monitoring System, are a vehicle safety feature that was introduced in 2005. Very Few vehicles have TPMS in 2005, but now it is becoming standard equipment on more vehicles every year. Customers who have TPMS can experience some cost savings due to this safety feature. A tire will loose its structural integrity when it is driven on little or no air pressure. This incident will result with the customer having to purchase a new tire, if that make and size is still available. If not available, the customer would be forced to purchase four new tires. TPMS sensors show the driver when the tire is reaching an unsafe level. This could end up preventing the customer from running a tire flat. When replacing a TPMS sensor on your vehicle, there are two options. You could buy a new sensor from the dealer or from an after market company. The aftermarket sensor will provide some cost savings to the customer but have also proven to be problematic with communication to the vehicle. TPMS development steamed from the Ford explorers that suffered from tragic tire separations in the late 1990’s. The Firestone recall for separating tires was linked to 100 deaths from roll over accidents. Ford produced the explorer with a Firestone tire that preformed well in test but when given real world conditions the tires failed. Firestone realized studies that showed the failing tires were under inflated and this was a main contributor to the tire failing. The new advancements we have seen in the industry saw tire manufactures introduce run flat tires. These tires will allow you to travel up too 80 kilometers at 80kph or slower to reach a safe destination. Battery failure has shown to be the failure of majority of TPMS sensors. STE engineering are the frontier company for developing a hybrid ceramic circuit which eliminates the need of a battery in the sensor. Having your tires properly inflated is critical to your tire life and will also help out your fuel economy, which leaves a smile on Mother Nature’s face.